Sealions - Steller Sea Lions - Eumetopias Jubatus, British Columbia. These burly sealions are distributed across the north Pacific Ocean from Japan to Alaska and down to the British Columbia Coast of Canada, and beyond to California. It seems that the population of these sealions is the most prolific in British Columbia due to the abundance of naturally oily fish which these carnivores prey on. 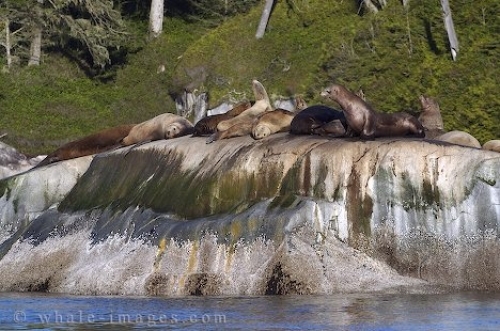 Photo of sealions on a rock off the British Columbia coast.